Do you have a stubborn or restless dog? 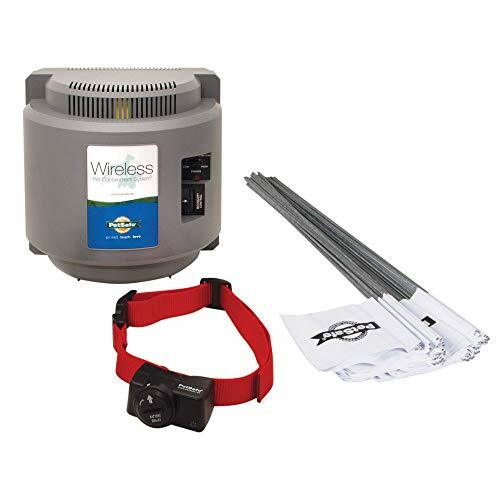 If so a long range wireless dog fence may be just what you need. As you very well know, all dogs have different personalities. This is what makes it difficult to train one pet versus another. For this reason many pet owners will just give up and resign to the fact that they will always have a dog that misbehaves. Training your dog is not as complicated or time consuming as you may think. Especially when you have the right tools at your disposal. Wireless fences give you an innovative way to train your pet without the hassle. Below you will find 5 of the best long range wireless dog fences on the market. And while each unit has been proven to help eliminate unwanted behaviors, your overall success will depend on how much time you actually invest in training your pet with the unit. With the PetSafe Free to Roam Wireless Dog and Cat Containment Fence your pet will be safe while also having the freedom to roam. And the best part is it costs 15 times less than a physical fence. It covers a circular area of up to ½ an acre and has no obstructed view. You don’t have to worry about digging trenches or burying wires. This makes set up quick and easy. Most pet owners have it up and running in as little as 2 hours. The circular boundary can easily be adjusted from 5 feet all the way up to 90 feet in all directions from the indoor transmitter. The PetSafe Free to Roam Wireless Dog and Cat Containment Fence is great for travel due to its portability. You can take it on camping trips, to the park, or anywhere else you will be travelling. Just plug the transmitter into a standard outlet and you will be able to contain your pet even while you’re on vacation. Once set up the transmitter will communicate with the receiver collar that is placed around the pets neck. Any time your pet ventures outside of the designated area a safe static correction will be delivered to the receiver collar. If your pet doesn’t stop and crosses over the established boundary zone another static correction will be sent to the collar in an effort to get the pet’s attention. Please know the correction is harmless and will never hurt your pet. The receiver collar comes with 5 levels of static correction. This gives you the ability to set the correction to a level that is suitable for your pet. There is also a tone only setting for those who would prefer not to use a static correction. All it takes is a few short training sessions and your pet will have a secure boundary to run around in. This unit can handle multiple pet’s as long as they are wearing a wireless receiver collar that is compatible with the PetSafe unit. 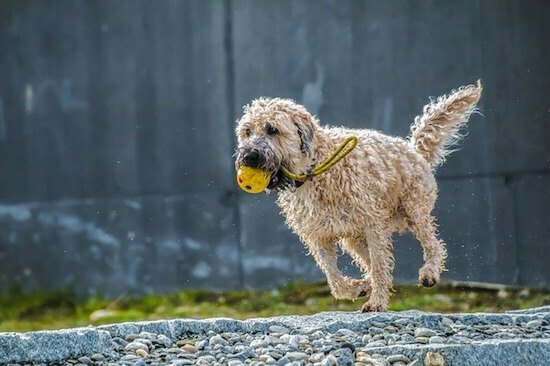 The receiver collar is waterproof and was designed to ensure your pet is always comfortable. Wireless boundary. Keeps pet safely in yard with no digging or burying of wires. Boundary is adjustable and can cover up to 1/2 acre or 180 feet in diameter. 5 levels of static correction giving you the ability to customize the system to your pet’s temperament. Easy set up. Can usually be up and running within 2 hours. Portable. Can be taken on camping trips and to vacation homes. Comes with manufacturers warranty. Please note the warranty is only valid if you purchase the product from an authorized retailer. Transmitter must be set up indoors. This can prove to be a problem for those who have irregularly shaped yards. Some users have complained about the collar breaking within a few months. You may experience an inconsistent signal if you live in an area with hills. The beep is very low making it difficult to hear. If you are looking for a safe and simple way to contain your pet then the PetSafe Wireless Fence Pet Containment System is for you. It covers a maximum of 180 feet in diameter and a minimum of 10 feet in diameter. This revolutionary system opens up a world of fun for both you and your pet. Just plug the transmitter in a location that doesn’t get a lot of attention, and you will be ready to go. Once plugged in the transmitter will send out a unique radio signal around your home. The lightweight receiver collar, which sits around your pets neck, will “listen” for that signal. Your pet is basically free to run around the yard without a leash and without being blocked in by a fence. Anytime he or she gets close to the boundary a warning tone will be sent to the collar. The goal is to get your pet’s attention so they will return to the designated area. If the pet chooses not to return a static correction will be sent to the collar. The static correction will startle the pet but it will not harm them. The receiver collar offers 5 levels of static correction as well as a tone only mode. This gives you the freedom to customize the level or reinforcement based on your pet’s temperament. Training your pet to understand their new boundaries is relatively simple. Generally speaking it only takes about 2 weeks for them to catch on. Thankfully there is an instruction and training manual included. Just follow the steps and you will be good to go. 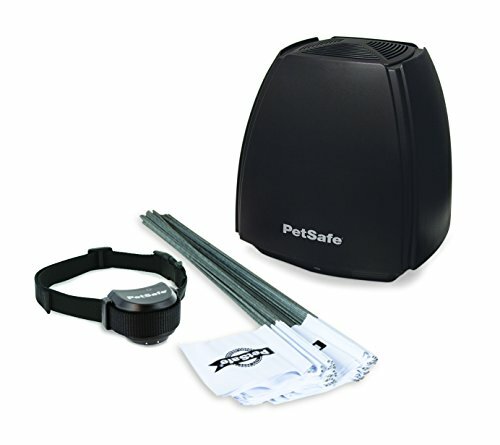 The PetSafe Wireless Fence Pet Containment System is compatible with all US 120V outlets. It cannot be used in 220V international voltage. In other words this system only works in the United States. When setting up this system keep in mind the transmitter must be located at the center of the containment area. The containment area is circular and cannot be changed into any other shape. When it comes to operating range, things such as metal objects, topography, and terrain can affect how strong the signal is. This unit is also portable which makes it perfect for trips. Just plug it into any outlet and you will be good to go. If you need to expand your pet’s play area you can connect additional transmitters to the unit. Wireless boundary that requires no fences or wires. Circular boundary covers up to 1/2 acre. 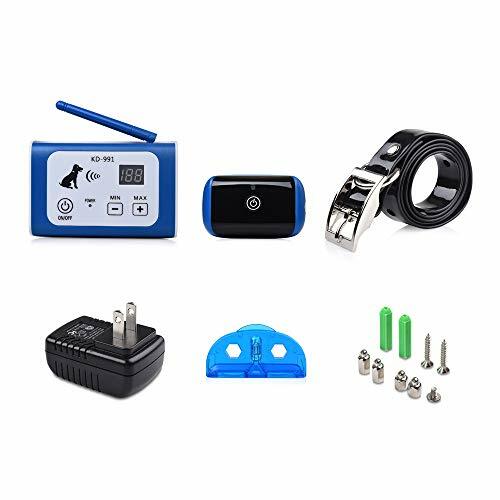 Receiver collar is waterproof and includes 5 levels of static correction. Has tone only mode for training. Easy setup. Can be up and running in 2 hours or less. It’s portable making it ideal for travel. System can handle unlimited pet’s as long as they are wearing compatible collars. Instruction and training manual included. Comes with manufacturers warranty. Warranty is only valid when purchased from an authorized retailer. Only works in the United States. Signal may be inconsistent due to terrain, topography, and metal objects. Some users have complained about the quality of the receiver collar. May randomly shock your pet. 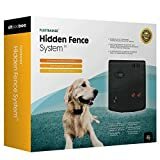 The Sit Boo-Boo Advanced Electric Hidden Dog Fence just may be the smartest long range wireless dog fence currently on the market. As you very well know, all dogs are unique and have their own personalities. Some dogs are sensitive, some are stubborn, some are quite, and others are overly aggressive. No matter what your dog’s personality type, this dog fence was created with him or her in mind. 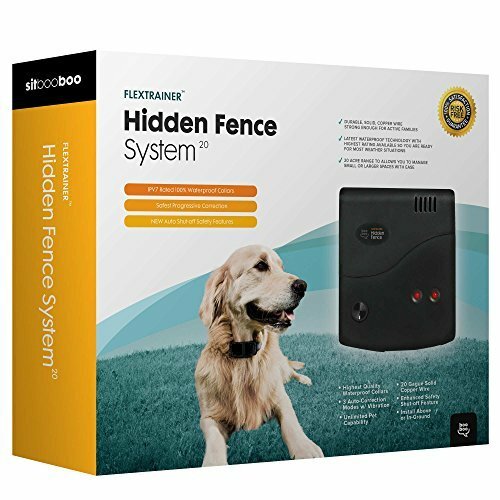 The Sit Boo-Boo Advanced Electric Hidden Dog Fence has an auto-correct feature that will automatically adjust the level of correction based on your dog’s personality. Instead of sending out the same level of static correction every time, the auto-correct technology will deliver a correction based on how close to, or far away, your dog is from the boundary line. As your dogs level of intention changes, so does the level of static correction. If you have a curious dog who likes to check everything out, a gentle reminder will be sent to the collar warning them not to get too close to the boundary. If on the other hand you have a more determined dog, a higher level of intensity correction will be sent to the receiver to ensure the pet doesn’t leave the boundary. The Sit Boo-Boo Advanced Electric Hidden Dog Fence was built from the same materials used in aerospace and marine construction. It comes standard with 500 ft of industrial grade solid copper core wire and a transmitter that can handle up to 20 acres of land. This basically means this device was built to last and that it is capable of handling almost any condition. The collar is 100% waterproof and has a weatherproof IPV7 rating. It will still work even it is completely submerged in up to 1m of water. This means rain and snow are not a problem for this well built collar. It will also work in temperatures that are freezing or below zero. The unit can support an unlimited number of collars as long as you invest in additional collars. Features auto-correct which allows your pet to be trained based on his or her personality. Has built in surge protection for extra safety. Built using the same materials that were used in aerospace and marine construction. Works in freezing and below zero temperatures. Collars have IPV7 weatherproof rating. Supports an unlimited number of collars. Comes with a 1 year replacement warranty. Some users have complained about the collar not vibrating or beeping before sending a shock. Collar may randomly activate even when your pet is well within the boundary. With the PetSafe Stay + Play Wireless Fence you can create a fun and safe place for your pet to roam around in. Once set up you will be able to create a circular boundary to contain your pet. The boundary can cover up to 210 feet in diameter or ¾ of an acre. The boundary is adjustable and can easily be changed with the turn of the dial. The transmitter should be set up in the center of the pet’s play area and plugged into an electrical outlet that is inside the home. Make sure the transmitter is set up in a location that is close to the area where you want to contain your pet. To help train your pet there are boundary flags included with the kit. The boundary flags can be used to temporarily define the play area. They will serve as a visual aid for your pet during training. Once everything is properly set up, which should take about 2 hours, the transmitter will send a constant radio signal to the designated pet area. If your pet approaches the boundary zone a warning tone will be sent to the collar. If the pet continues to stray past the boundary zone a static correction will be sent in an effort to get him to return to the pet area. The collar has five levels of static correction as well as a tone only option. This ensures you are able to find the right fit for your pet’s temperament. All levels of correction are considered safe for your pet. Generally speaking it only takes a few training sessions for your pet to understand his or her new boundaries. Once the boundaries are understood your pet will have more freedom to run around and have a good time. The PetSafe Stay + Play Wireless Fence is portable making it easy to take with you wherever you go. Once your pet becomes familiar with the system you can take it with you to the park or on vacation. No matter where you are, your dog should be familiar with the warning tone and know it means to stop and not go past the boundary. 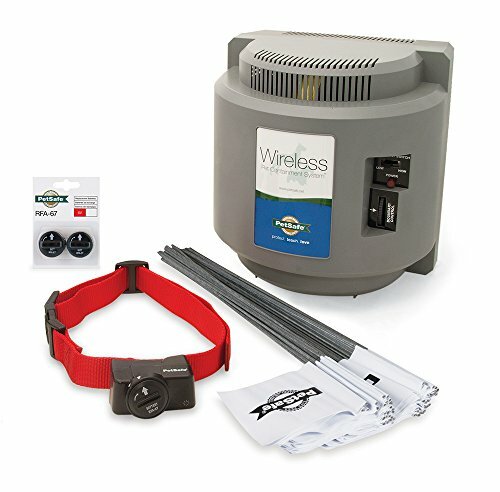 Wireless boundary that allows you to keep your pet safe with no digging or wires. Adjustable boundary can cover up to 210 feet in diameter. Come with 5 levels of correction plus a tone only mode for training. Collar is rechargeable and can last up to 3 weeks on one charge. Portable. Can easily be taken on vacation or if you move to a new home. Comes with manufacturers warranty. Warranty is only valid if unit is purchased from an authorized retailer. Circular boundary cannot be changed into another shape. Signal can be interfered with by various factors including metal objects, topography, and terrain. Some users have complained about the product not working after a few months. 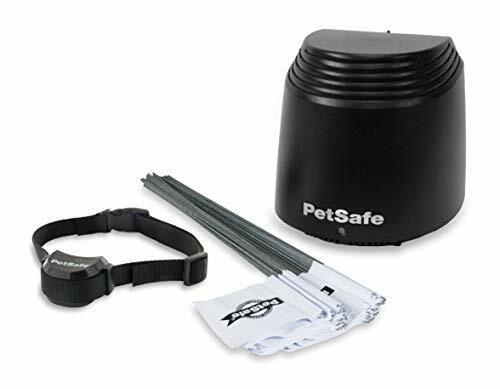 The PetSafe Wireless Fence (PIF-300) offers the perfect mix of safety and portability. It is the first electronic containment system with instant installation. Setting it up is as simple as plugging in a cord. Once the unit is set up a constant signal will be used to create what is known as the “stay zone”. This is the area that you designate as a safe space for your pet to be in. Anytime your pet leaves the “stay zone” a mild correction will be sent to the collar. The correction will continue until your pet has returned to the designated area or until 35 seconds have passed. The PetSafe Wireless Instant Fence is 100% portable and can be taken wherever you and your pet go. The unit can cover up to half an acre or 180 feet in diameter. The collar features 5 adjustable levels of correction as well as a tone only mode. There is also run through protection which is designed to remind your pet to return to the “stay zone”. In the event of a power outage the unit will automatically turn off the collar containment area to prevent unwanted shock. Invisible line may move without warning which could result in unnecessary correction. Signal can be blocked by metal objects such as cars. Some users have complained about the collar no longer working after 3 months. The NeoPaw Dog No Bark Training Collar with Remote Wireless Dog Fence Containment System will safely keep your pet in the yard. The adjustable wireless boundary covers up to 2 acres which gives your pet plenty of room to run around. The receiver is waterproof and is perfect for pets over 5 Ibs. This product should not be used on dogs who are prone to aggressive behavior. Users have complained about the quality of the collar. Want to check our list of Best Wireless Dog Fences, please click here.